SNAFU! : The F-35's EOTS is obsolete to the point of being behind current Sniper/Lantirn Pods. The F-35's EOTS is obsolete to the point of being behind current Sniper/Lantirn Pods. Instead of relying on weapons like the GBU-49 with a built-in ability to prosecute moving targets, many combat aircraft employ electro-optical targeting systems, or EOTS, with “lead-laser guidance” — which calculates how far a weapon should travel beyond the target’s current location in order to hit it. 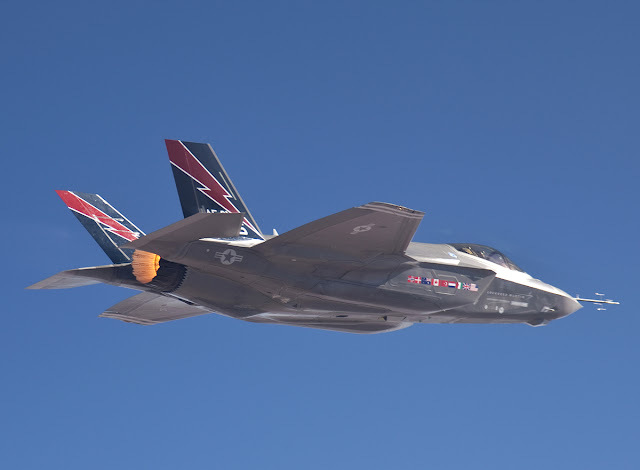 However, the F-35 EOTS was designed when that tech was still in its its infancy, so while the system can find a moving target, lock onto it and track it, an F-35 pilot still has to predict where a target will move and aim there, Pleus said. The GBU-49 wasn’t originally included in the Block 3F weapons loadout, which, along with new software, will make the joint strike fighter fully mission-capable. The service decided to incorporate it within the last six to nine months, said Brig. Gen. Scott Pleus, director of the Air Force’s F-35 integration office. “The ability to hit a moving target is a key capability that we need in current close-air support fight, and the GBU-49 is a great solution for the F-35 and, frankly, for all of our legacy platforms to hit these moving targets,” he said during a February interview. So what does this mean? It means that our assertion that the F-35's EOTS is obsolete is confirmed. It means that every plane produced before Block 4 will require massive upgrades. It also explains why Singapore and others are delaying their buys of the airplane. It just isn't as good as the fanboys want you to believe.